This Sand Stopper spin down system is ideal for filtering out coarse sediment without the need for cartridge replacement. A polyester screen filters the sediment. Periodically the sediment will need to be removed. This can be done by simply opening the purge valve allowing the sediment to be flushed out via centrifugal action. The polycarbonate transparent sump permits monitoring of trapped sediment. Approximate dimensions 5 inch width x 11 inch length. This is a low cost high quality alternative to the Rusco 1-24-f and the Campbell FT4-24. 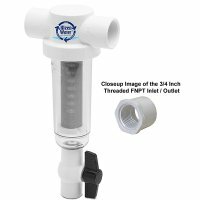 The 3/4" inch female threaded FNPT pvc inlet outlet head provides a 20 GPM flow rate. This filter housing is manufactured from the highest quality NSF listed, FDA grade materials. Please enter model # KWSStop-RE-30M-Holders2 in the Amazon search bar to order a replacement filter screen. Please note - for all related products: 30 mesh (711 micron) is ideal for lawn irrigation filtration. 100 (152 micron) mesh is ideal for domestic well water applications. 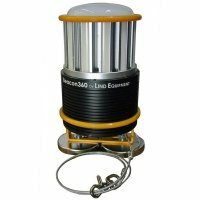 60 (254 micron) and 250 mesh (61 micron) are available for unique applications. It is recommended that the filter screen be manually cleaned or replaced annually.